I'm giving this a good go now. We've skirted around potty training for a bit, getting him used to sitting on the potty and trying to convince him that he shouldn't use it as a shoe or a hat.... Today we broke out the cloth pants! Jack isn't very impressed just yet. He doesn't like being wet. I hate having him do something that makes him unhappy, but if he doesn't like being wet and he can feel it now (instead of being in a nappy where he can't) then I'm hoping he'll make the connection to using the potty before he wees. So far today he has gone through 4 pairs of undies, all wees. He is coming to tell me he's wet sometimes, and sometimes saying potty after he's wee'd, so I think that is progress. But the last time - which was just before nap time - he said he wasn't wet even though I saw the damp patch, and when I asked him to come over to me so I could change him he got a little tearful. It was nap time though so he was tired and emotional anyway. He's got a nappy on for his nap. I'll stick him in a pair of undies when he wakes up - after a sit on the potty for a bit - and see how he goes from there. 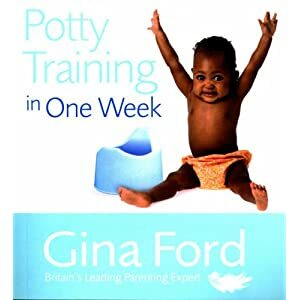 I'm looking at the Gina Ford Potty Training in One Week book. It seems pretty good. I've had it for a while and it's reading that book which has put me off trying to train him seriously before now. With Jack coming on with his talking he finally checked all the boxes for being potentially ready. Although, I still think it'll take longer than a week judging by today. I think it'll be a few days before he's happy in his cloth pants and with using his potty.